A satellite image from Google Maps highlighting Crebilly Farm, where Toll Brothers seeks to build more than 300 homes. Largely existing as farmland today, the property is bordered by Route 202, Route 926, West Pleasant Grove Road, and South New Street. Westtown Township in Chester County includes just 8.8 square miles, boasts a population of less than 11,000, and, according to the U.S. Census Bureau, added only 10 units to its housing stock between 2014 and 2016. If home builder Toll Bros. has its way, however, that number of new homes won't be so small in the future. After weeks of silence about Westtown's decision in December to deny Toll's bid to build more than 300 homes on a Chester County farm, Toll has struck back. This week, the Horsham-based luxury home builder asked a Chester County Court judge to reverse the local board of supervisors' decision and approve Toll's application to build. "The reasons for denial set forth in the board's decision constitute an abuse of the board's discretion, are improper as a matter of law, and are not supported by substantial evidence," said the appeal, filed Tuesday. Calls to Township Manager Robert Pingar for comment were not returned. Members of the township's board of supervisors were not immediately available. Toll's appeal — which comes nearly one month after the supervisors released their explanation of why the homebuilder was denied — is the latest twist in a saga that started in October 2016 when Toll first proposed building on Crebilly Farm. Toll says it had entered into an agreement of sale for the property with the Robinson family, longtime owner of the farmland. The purchase price was not disclosed. Before long, however, Toll's plans faced pushback from scores of neighbors, who pleaded that the land be preserved as open space, citing concerns over traffic, air pollution, and "reduced quality of life." Organizing under the name Neighbors for Crebilly Farm, the residents, coming from across Chester County, also argued that the land has ties to the Revolutionary War. Specifically, they said, Hessian troops and the Continental Army may have traveled and had skirmishes on or near the land. Ultimately, after months of hearings, Westtown Township's three supervisors, two of whom are Republicans and one a Democrat, denied Toll's application — despite the township's planning commission ultimately giving the builder a recommendation for approval earlier that year. In a 53-page document issued last month, the township listed several reasons for denying Toll's request, including concerns over road placement, traffic, storm-water management, and the disruption of "scenic views." Potential ties to the Battle of Brandywine were also a concern. In Toll's appeal, the builder said it had complied with the applicable land use rules in the township's zoning ordinance. Specifically, Toll argued that the township's reasons for denial were flawed — the board cannot require Toll to build a "collector road," through the property, Toll contended, for example. And, Toll continued, the township's argument that "scenic views" would be disrupted is "entirely subjective" and "undefined." 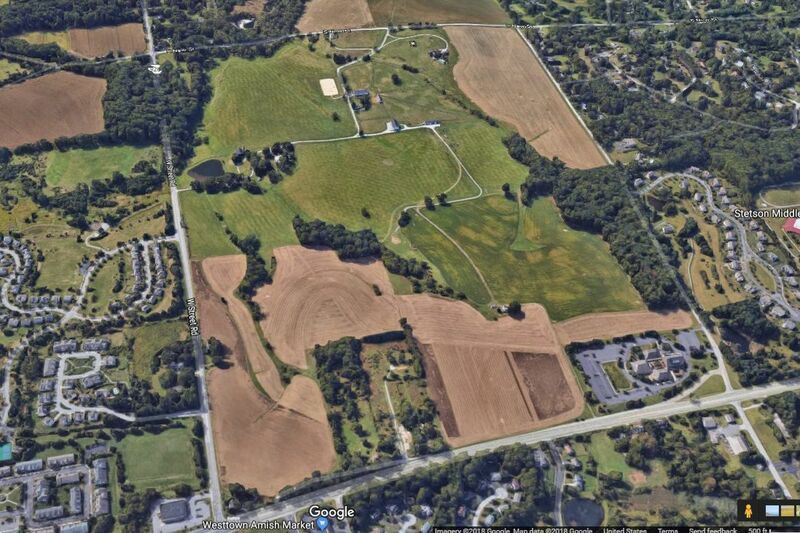 Toll's application is not the first time that developers have sought to turn the prized Chester County farm into development. More than a decade ago, officials approved the construction of a retirement community on 60 acres of the tract, but it was derailed by the recession. A proposal for apartments followed, though the developer withdrew its application after negotiations with township officials. The land, bordered by Route 202, is zoned for residential development. In Westtown's comprehensive plan, adopted in 2001, officials said "the preference would be that the land remain as a scenic working farm" but acknowledged "if that is not practical, then alternatives need to be provided." Among the potential uses proposed by officials: A golf course, "which would help preserve the scenic character of the site," officials wrote, "a mix of housing types," or "very light business uses." "Every effort will be made to avoid the development of this area and the Agricultural Cluster areas in large lot single-family detached houses that would destroy the character of the land," officials wrote. For years, Chester County has been one of the fastest-growing suburbs in the region — with a development boom to boot. Westtown Township's growth, however, has been generally flat, according to census data. Since 2000 just 278 homes have been built in the township, the data show, while the township has grown wealthier. In 2016, the median income in Westtown Township was $116,949. The average price of a Toll home in the first quarter of 2018 was $826,000, the company reported.